In the picture: Senior Nursing Tutor Mary Rusere takes a look at the new books while the Library Assistant Rachel Mukaro makes a record of the books received. 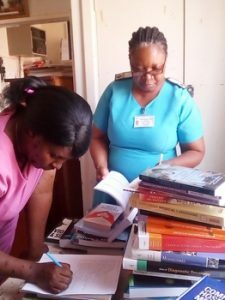 UBH library received a consignment of new medical books from Book Aid International through Bulawayo Book Distribution Committee on the 27th August 2018. The donation is yet another addition to the library collection. The donation will assist student nurses undertaking programmes in General nursing, Ophthalmic Nursing and the recently launched Advanced Orthopaedic Nursing.